Director-producer Bert I. Gordon (affectionately nicknamed "Mr. B.I.G.") has been working in the film business for over 6 decades. He directed cult favorites like Food of the Gods (1976), Empire of the Ants (1977), Necromancy (1972) and Picture Mommy Dead (1966). He's worked with such Hollywood legends as Basil Rathbone, Orson Welles, Lon Chaney Jr., Ida Lupino, Zsa Zsa Gabor and Joan Collins...and he lived to tell about it! Gordon also gave us numerous other movies through the years including King Dinosaur (1955), The Cyclops (1957), The Amazing Colossal Man (1957), Earth vs. The Spider (1958), Attack of the Puppet People (1958), Village of the Giants (1965) and Satan's Princess (1990). His autobiography The Amazing Colossal Worlds of Mr. B.I.G. was published by CreateSpace in March 2010. His official website is bertigordon.com. When I was a very young youngster, I got hooked on science-fiction and horror movies. I couldn’t get enough of them. 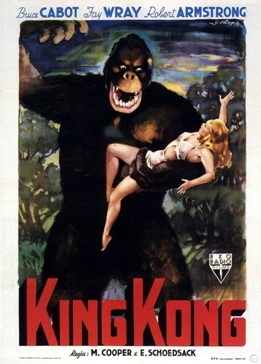 However, the movie I saw many years ago which influenced me most -- and certainly influenced me as far as the type of Sci/Fi-Horror movies I personally wanted to make -- was the original King Kong, directed by Merian Cooper and Ernest Schoedsack, and starring Fay Wray, Robert Armstrong and Bruce Cabot. I saw King Kong in the theater when it first came out in 1933. I went with a childhood friend at the time. I was around eleven years old. And it scared the hell out of me! 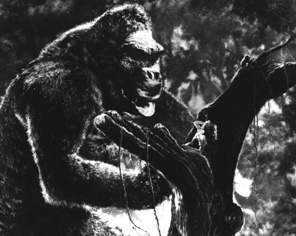 Kong’s giant size and all...and the lasting impression on me of that single movie (not to mention many other horror films) resulted in the development of a strong desire to make horror movies in my adult life. Indeed, that’s what I did when I grew up. I went to Hollywood and didn’t quit knocking on doors of the film studios until I became a bona fide Hollywood filmmaker...making sci/fi-horror movies. Giant grasshoppers invading Chicago in Beginning of the End. A giant, one-eyed monster in The Cyclops. A sixty-foot terror in The Amazing Colossal Man and again in its sequel War of the Colossal Beast. Earth vs. the Spider with its huge, hairy tarantula. The fifty-foot-tall ogre in The Magic Sword. Village of the Giants with the twenty-foot-tall teenagers. Huge rats in my H.G. Wells-inspired story The Food of the Gods. And Empire of the Ants with its monstrous ants. It quickly became very apparent to me, in hindsight, that King Kong was the culprit who influenced me into producing my horror movies with big monsters. I sort of liked the guy.